Editor’s Note: Please welcome my friend Hannah to the site today for another great blog post! Hannah is the founder of Whole Simple Life and is a formerly sick and tired Mama who is reclaiming her health naturally, one step at a time. She teaches others about cultured foods, unprocessed, and sugar free eating, green smoothies, and stress and anxiety management! Stop by her site to join her for lots of great articles on natural health and wellness and to be inspired to lead a healthier more positive life! This slow cooker sausage and zucchini stew is easy to make in a pot over the stove or in a slow cooker. It’s simple and extremely flavorful and satisfying. Anytime I make this stew to bring to a gathering I always get compliments and come home with an empty dish! You could use any type of ground meat that you like for this slow cooker sausage and zucchini stew. One thing I like to do is season my own plain ground meat so I can control the ingredients and make sure that I’m not getting any artificial flavorings or preservatives. I’ve included the recipe for my sausage seasoning below. You can use the seasoned meat of your choice in any recipe from meatballs to breakfast sausage. Now for the slow cooker sausage and zucchini stew. I throw all the ingredients into the slow cooker in the morning and set it on low and by dinner time the house will be smelling wonderful! I do brown up the ground meat before I throw it into the slow cooker. 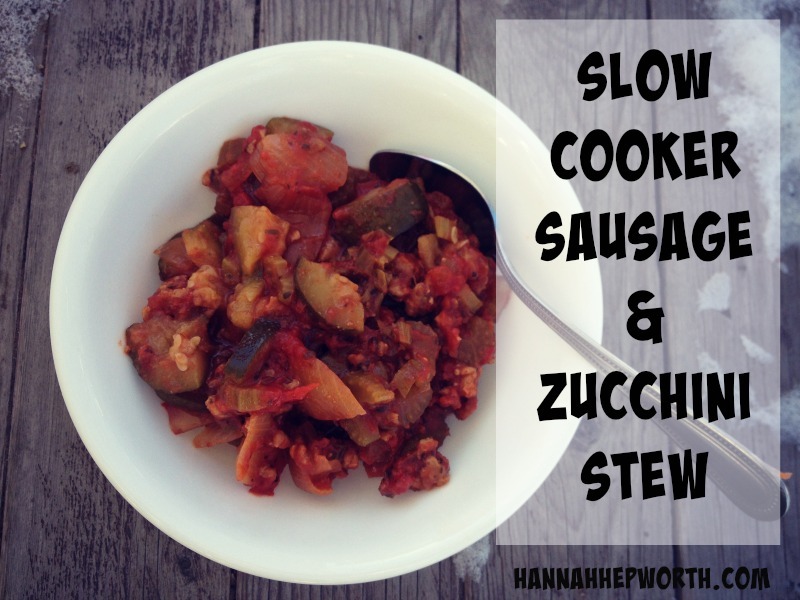 It gives the stew a nice rich flavor, but if you are short on time, you can skip this step and the Slow Cooker Sausage and Zucchini Stew will still be delicious! The sugar in the recipe isn’t totally necessary, if you’re like me and going without sugar then you can simply omit it. Serve this stew with a salad and sliced artisan bread to round out the meal. Brown meat first then place all ingredients into the slow cook on low and cook for 6+ hours. Enjoy! Note: if you are short on time, you can skip the browning of the meat, but it does lend some rich flavor to the stew. What is your favorite slow cooker meal? Leave a comment below! I just subscribed & am excited about your site! I just subscribed and am looking forward to lots of great recipes. I do have one favour to ask though. I live in England and in terms of ingredients we are very much a nation divided by language. Please can you also include the British name for ingredients. Also when you talk on terms of 1 cup how big is that cup? I love the sausage and zucchini casserole and am looking forward to the green smoothies. Many thanks for getting it all together and best wishes. Hi Elle – Thanks for your subscription and readership! All units of measurement on this site use the U.S. Customary Units. You may be interested in trying an online conversion calculator that would covert the measurement into another form. This one looked good: http://www.convert-me.com/en/convert/cooking/. As far as names of ingredients, they will be standard American names, but if you ever have an questions about what a specific ingredient is, please don’t hesitate to let me know! How big of a crockpot are you using for this? Hi RobertJim – Thanks for stopping by. I use a 6-quart slow cooker for this recipe. Hope that helps!